Private Beach residential area directly on the Ocean 4.5 miles North the Pier ! LET THE OCEAN LULL you TO SLEEP !!! 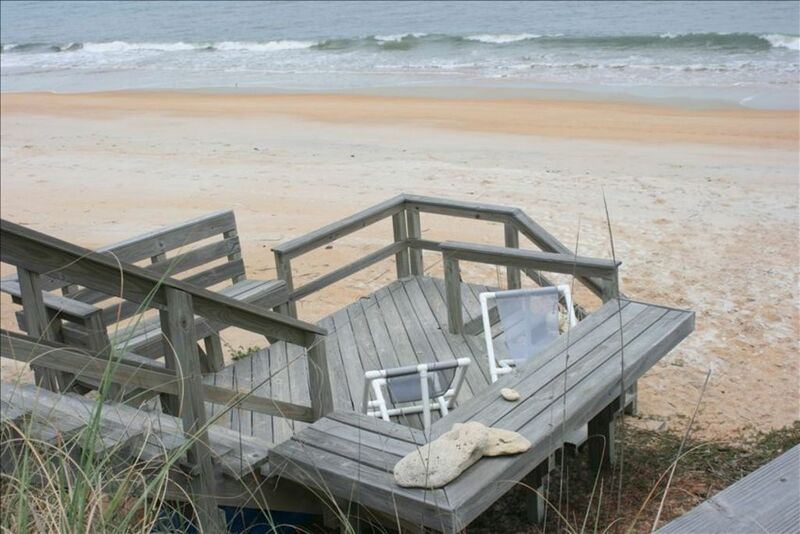 Our Oceanfront Duplex is located four and one-half miles North of Flagler Beach directly on the Ocean, 50 feet from the water's edge, in a private area of the beach, among several private homes. The two floors have been sound proofed and you have your own private entrance. Your privacy has not been compromised. The lower unit has an excellent view of the ocean from the living room, master bed room and newly remodeled porch. You can ALWAYS hear the waves breaking on the beach. , the upstairs has a deck to seat , relax and enjoy the breathtaking birds-eye view sunrises , the entire unit has been just remodeled/upgraded (December 2017)and we added a second bathroom, so we now offer a 2 bedrooms/ 2 baths !!! It is very nice and very clean. We have a large newly remodeled open East porch that overlooks the ocean, manicured yard, and private dune walk over with a sitting/tanning deck at the bottom. We have an Ocean Kayak, surf and boggy boards, beach chairs and beach toys for your use. All you need to bring is your favorite beach towel and sun tan lotion. If you are looking for a private beach area away from the condominiums and crowded beaches that is DIRECTLY on the ocean this is the place for you. We are 20 minutes from St. Augustine and also Daytona, and 90 minutes from the attractions in the Orlando area. We also have local knowledge about the best places to eat, shopping, places to go, things to do and site seeing to help you get the most out of your vacation. If you like to surf fish, we have some of the best surf fishing on the East coast right in our back yard. I Will even show you how to tie my super secert surf fishing rig, guaranteed to catch lots of fish. (Photos of recent catches available upon request.) We supply everything that you need except your fishing poles. We recently added a second full bathroom on the upper unit !!! We’re 40’ from the Atlantic Ocean !!! We have a wireless connection for your use, but you have to bring your own computer. New stainless steel and quiet. We have DirecTV with all the channels. HBO, Cinimax, Showtime, all sports channels and much more. We have several, 3 dozen or so, movies available upon request.